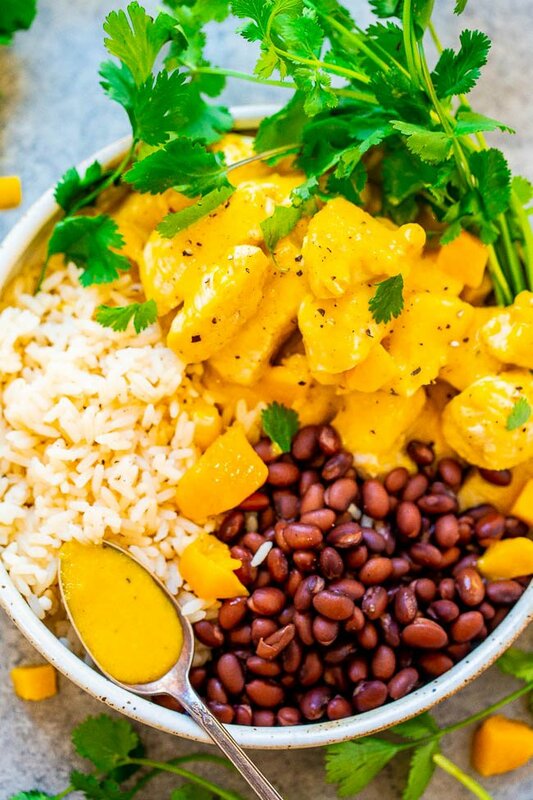 15-Minute Mango Lime Chicken with Rice and Beans – EASY, healthy, and the mango sauce spiked with lime juice is SO tasty!! 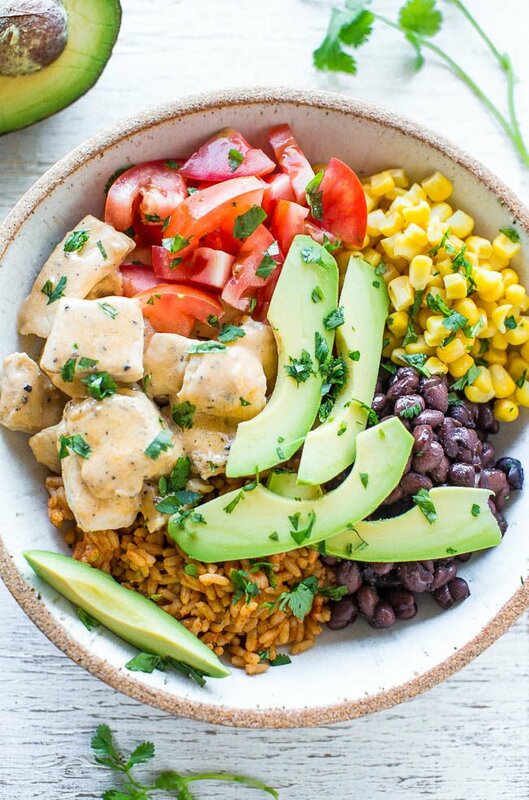 You can’t go wrong with Mexican-inspired flavors, JUICY chicken, and rice and beans!! 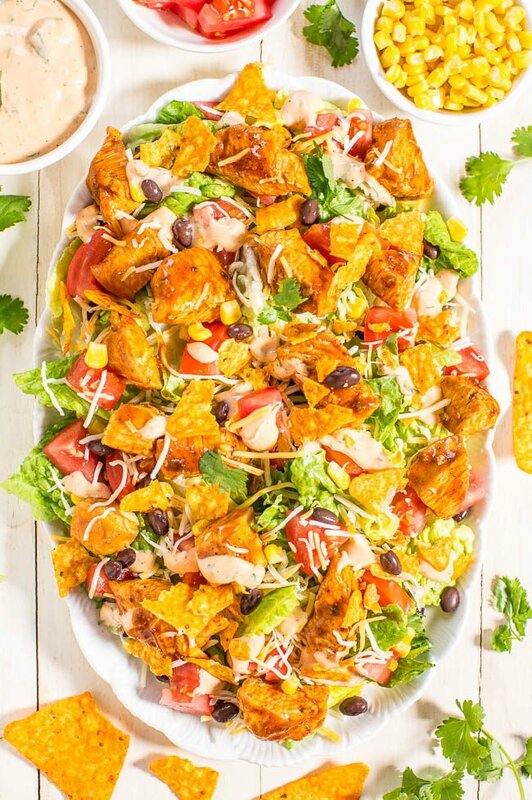 This recipe is so easy, healthy, ready in under 20 minutes, and naturally gluten-free. 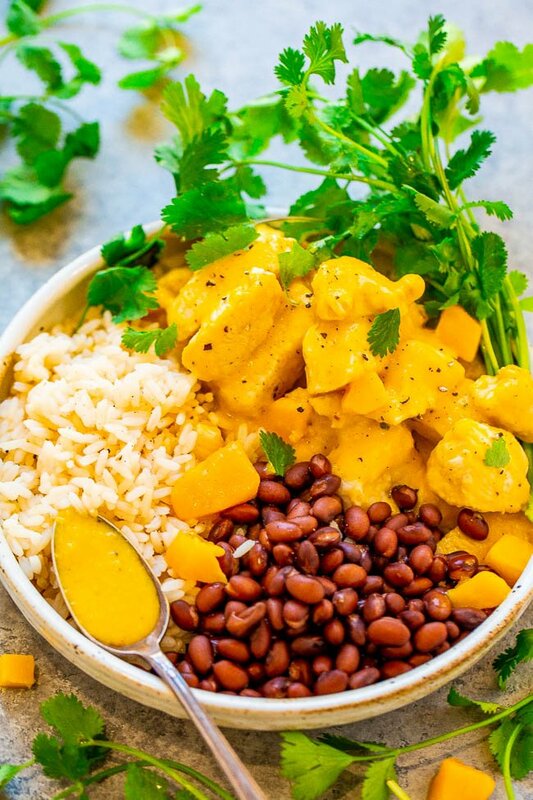 Tender pieces of chicken are simmered in an easy yet super flavorful mango sauce that’s spiked with lime juice, garlic, brown sugar, and a pinch of cayenne if you like the heat. Fresh mango always tastes best but you can cheat if you have to and use frozen mango that you thaw and drain off the water. The sauce made in 1 minute in your food processor or high speed blender. So easy but so much flavor. The sweet mango is perfectly offset by the lime juice and I use this sauce in so many other ways. The flavors in the sauce mellow and marry in the skillet. So if you like it straight from the blender you’re going to love it after it’s been cooked for a few minutes. I could even see adding red curry paste and coconut milk and making a Thai-inspired curry but that’s a whole other direction but a good one. The chicken stays so juicy and moist thanks to the mango sauce. 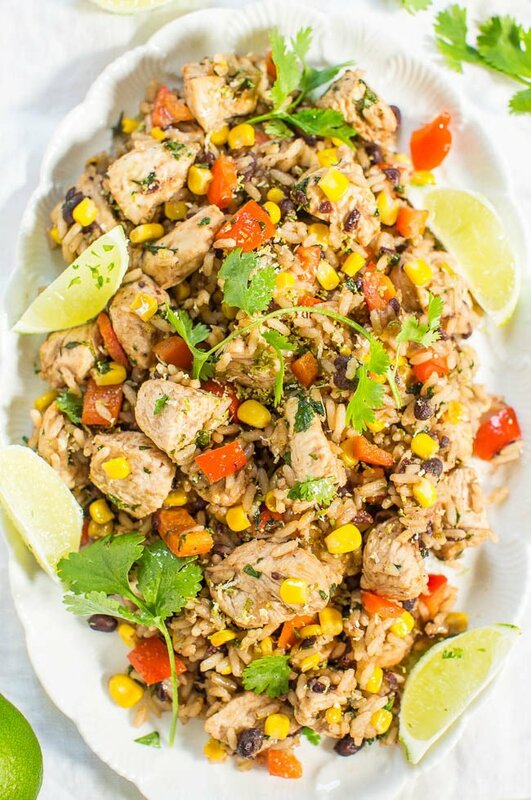 I served the chicken with rice, black beans, and garnished everything with fresh cilantro. I used precooked rice to save time but you can make it from scratch or sub with quinoa, couscous, or another favorite grain. 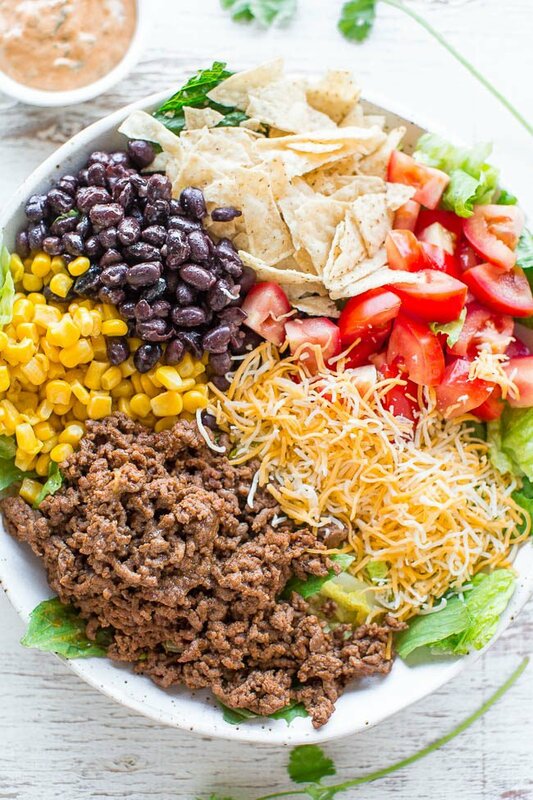 You can also skip the rice and beans and go in the direction of a nice fresh salad with lots of veggies if you prefer. 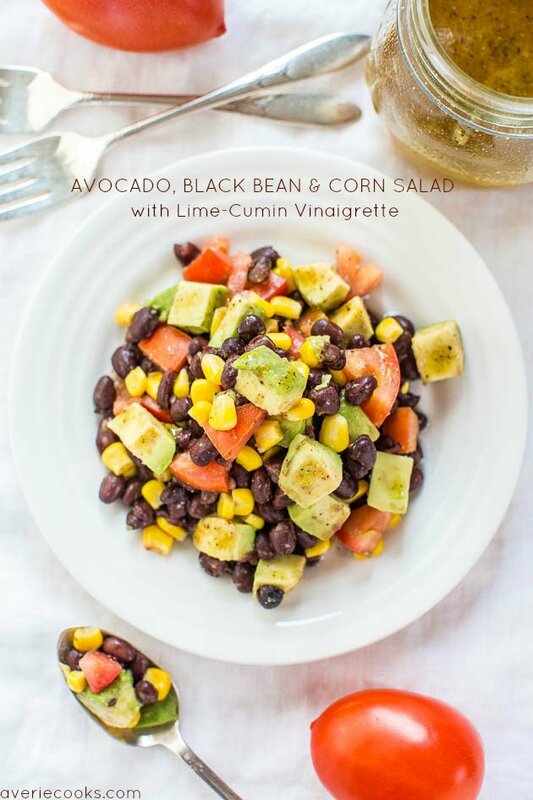 I think this Avocado, Black Bean and Corn Salad would be a great pairing. To the canister of a food processor fitted with the S-blade or high speed blender add the mango, about 4 tablespoons olive oil, lime juice, brown sugar, garlic, salt, pepper, optional cayenne pepper, and mix on high speed until smooth and emulsified. If necessary, add additional oil to get things moving in the food processor and until sauce comes together in a thick but pourable consistency. Taste and make any necessary seasoning adjustments if desired; set sauce aside. To a large skillet, add 2 tablespoons olive oil, chicken, season evenly with salt and pepper, and cook over medium-high heat for about 4 to 5 minutes, or until chicken is cooked through. Stir and flip intermittently to ensure even cooking. 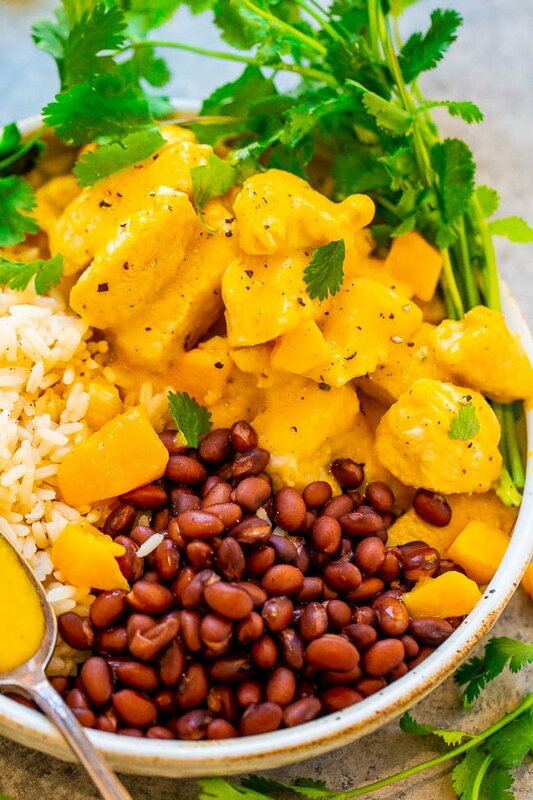 After chicken is cooked through, reduce the heat to medium-low, and evenly drizzle as much mango sauce as desired over the chicken (you may have extra that you can save for another use or discard or reserve for drizzling over food when serving), stir to coat evenly, and simmer gently for about 1 to 2 minutes. Remove the chicken from the skillet and evenly divide the chicken, rice, and beans between the serving bowls. 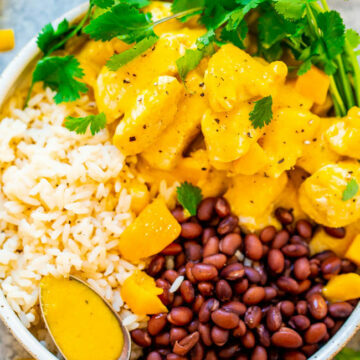 Add additional mango sauce over the rice and beans or chicken, if desired. 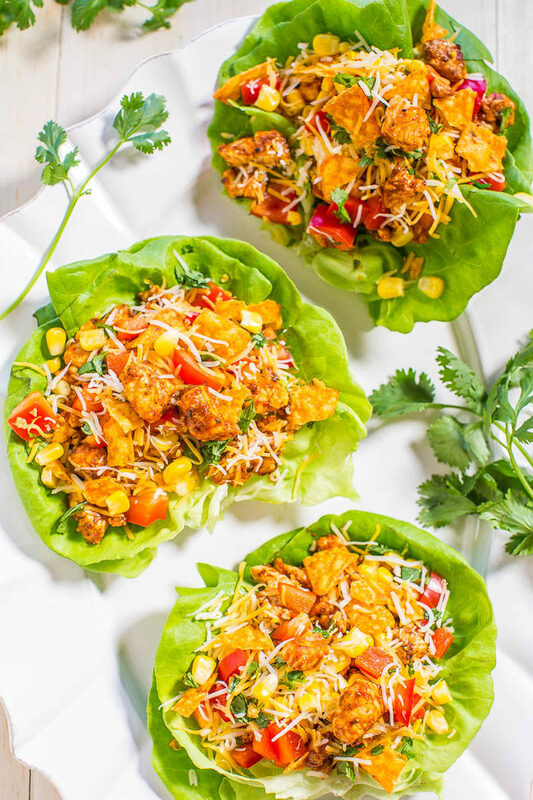 Garnish with cilantro and serve immediately. Recipe is best fresh but will keep airtight in the fridge for up to 5 days. 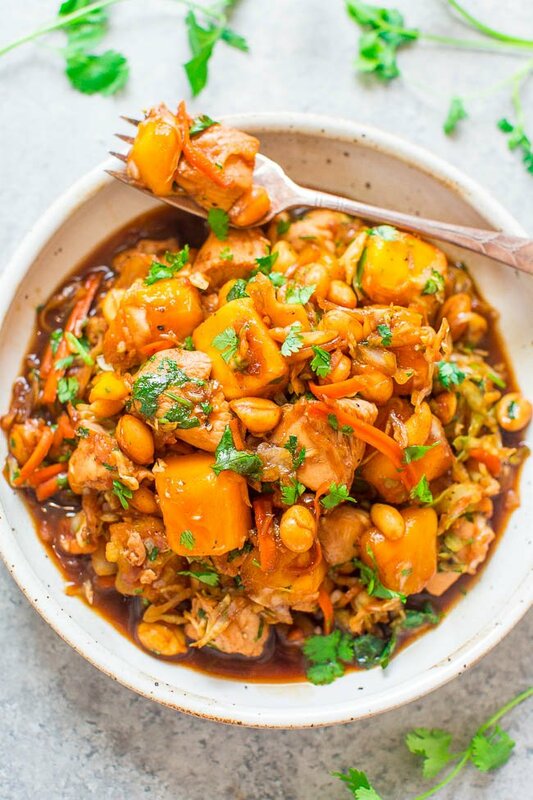 Sesame Mango Chicken – An easy Asian-inspired recipe with tender sesame chicken, juicy mango, and soy-garlic-ginger infused cabbage and carrots! 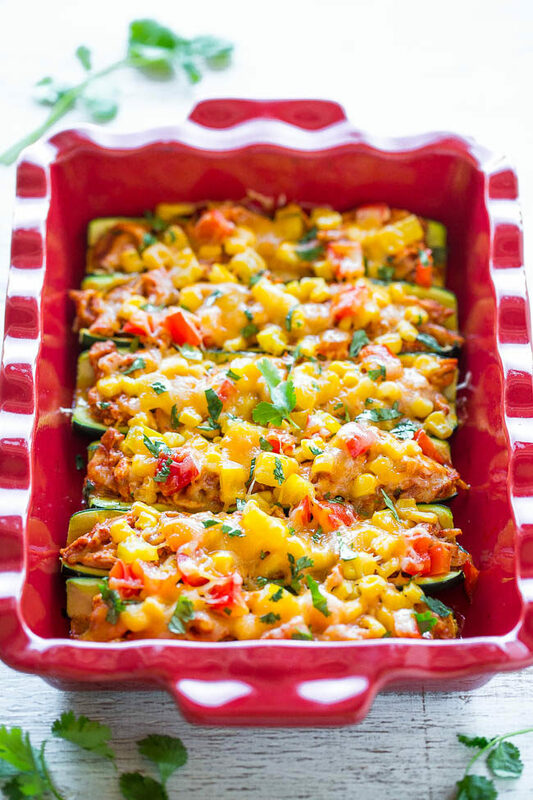 One skillet, ready in 15 minutes, and perfect for busy weeknights! Thank you and I love it when food colors can be bright and fun like this one! The mango sauce is such a bright gorgeous yellow!! 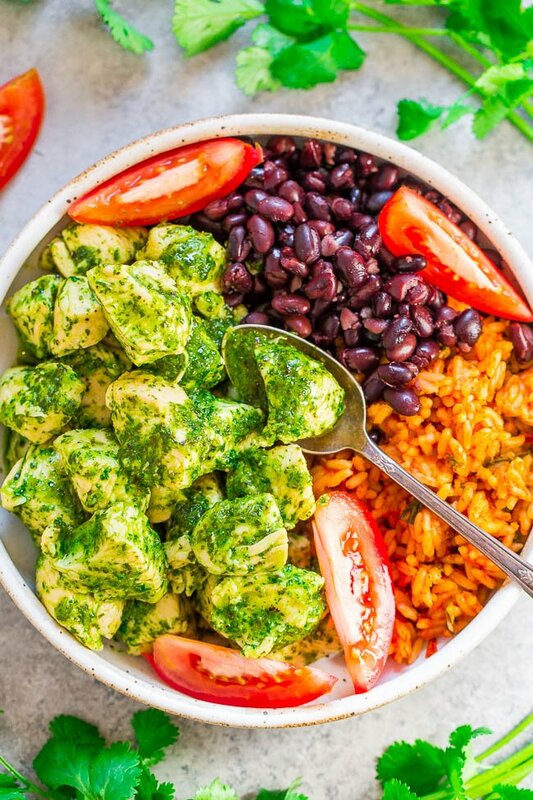 This sounds delicious and so nice for a summer meal too….I am already thinking this sounds lovely for Friday. I loved the color of this sauce. It just made me smile to see that bright yellow sauce! The mango sauce is the star–so good!! I made extra (you know me–sauces easily become salad dressing). We really enjoyed this! Glad the other recipes look good to you, too!